For the sixth consecutive year, First National Bank Alaska has supported the Getting Ready for College program at the University of Alaska Southeast with a gift of $26,000. The goal of the program is to educate students (grades 5-12) in rural Southeast Alaska on the positive lifetime economic impact of continuing their education past high school. The program strives to help students prepare for success after high school by providing training and resources to students, their families and local education professionals. In 2011, UAS staff delivered the program to more than 1,500 students located in 17 communities throughout Southeast. This year the program will be extended to include Bethel. First National Bank Alaska is Alaskan-owned and operated since 1922 with ATMs and 30 branches in 18 communities throughout the state. 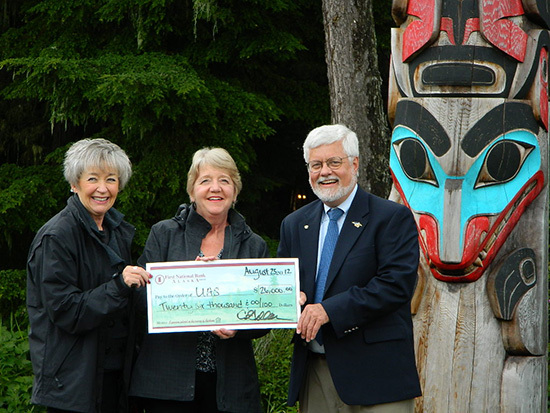 Left to right: Linda Gordon (wife of George Gordon, Director on the Board of First National Bank Alaska) Suzie Longacre (wife of Senior Vice President Doug Longacre) John Pugh.